SM-AFS PRO SERIES A FRAME GUITAR STAND. Universal collapsible A-frame guitar stand. Unique contoured cradles holds acoustic or electric instruments. Features Pin -Pull locking clutch and finish friendly cradle and back rest. Chrome Guitar Stand. Adjustable tripod with rocker and sturdy tubular metal frame. Protective rubber on all contact points. Taiwan. Black Guitar Stand. Adjustable tripod with rocker and sturdy tubular metal frame. Protective rubber on all contact points. Taiwan. Guitar stand triple- black. Keep all your guitars in one stand! Holds three guitars (electric or acoustic) or basses. Non-reactive sponge arm and neck. Sturdy tripod base. Guitar Hanger facing Straight. Popular chrome headstock hangers . Readily fits peg board, slat-wall or can be mounted on or clamped into timber. Neck protected by rubber. Taiwan. Guitar Hanger facing Left. Popular chrome headstock hangers . Readily fits peg board, slat-wall or can be mounted on or clamped into timber. Neck protected by rubber. Taiwan. Guitar Hanger facing Right. Popular chrome headstock hangers . Readily fits peg board, slat-wall or can be mounted on or clamped into timber. Neck protected by rubber. Taiwan. 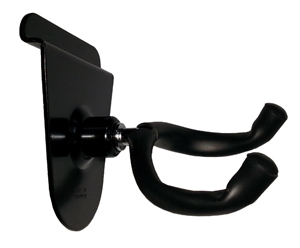 Guitar Hanger adjustable angle - 180. Popular chrome headstock hangers. Readily fits peg board, slat-wall or can be mounted on or clamped into timber. Neck protected by rubber. Taiwan. Practical leather strap hanger for an alternative method of displaying guitar. Aesthetically pleasing solution for home situations. Strap simply loops over the buttons of the tuning heads. Fur cover protection for guitar stand.